Physical Therapy for Mount Prospect, IL Des Plaines, IL and Elk Grove, IL : What is Degenerative Disc Disease? I HAVE DEGENERATIVE DISC DISEASE. WHAT DOES THAT MEAN? What is Degenerative Disc Disease and How you can Manage It? So you had your MRI and you’ve been told that you have a back disc problem..not what you wanted to hear. These are all the same questions that I hear from patients every day after they have left the physicians office. But don’t worry, for most people a bulging disc is actually common. It can be there and not cause any pain in most cases. It would be like having a scar or a callus that may not look good but generally doesn’t bother you much either. Scars and calluses are responses from the body to compensate for forces that are affecting that region. In the same way, a disc bulge occurs when the body is adapting to all the forces that are placed on the spine. Most people don’t even know it is happening until they get an MRI. Most people don’t get an MRI until they’re already having back pain. Because disc bulges tend to be the most obvious defect on an MRI, they get blamed as the source of your back pain. There are varying phases of disc injury that medical professionals use to rate the severity. Disc Degeneration – Commonly found as we age. Can be pain free. Minor injury to outer disc can heal with correct treatment. Prolapse – Less common than disc degeneration. It might press on a nerve. There’s a notable bulge on the disc. Physical therapy can help. People can live with this and not have pain. Extrusion – Not common. The disc nucleus is exiting the center, but remains attached. The outer ring of the disc is torn. Surgery might be performed. Sequestration – Rare. The nucleus is detaching from its place. Likely lots of back and leg pain is present. Surgery is imminent. More disc bulges tend to show up on MRIs as we get older. It’s a normal part of aging. What’s important to take away here is that it doesn’t mean that you NEED surgery. It used to be common practice (in some places still is common practice) to have surgery soon after the disc bulge was detected. It is slowly becoming more common in the medical field for physicians to delay getting an MRI for 4-6 weeks. During that time low back pain patients may start physical therapy or have a cortisone injection to alleviate the pain. If therapy and injections don’t help, the n an MRI is ordered and patients are usually sent for a surgical consultation. 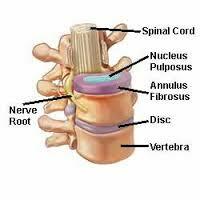 Besides the disc, there’s nerves, facet joints, muscles and ligaments all really close together in the low back. Any one of those tissues could be causing your low back pain. It’s difficult to pinpoint the right tissue, but discs have frequently been blamed because of the way they look on an MRI. It takes a thorough physical examination by a skilled medical professional to have the best chance at finding the true source of your back pain. Once the source is found, then the right treatment can begin. Surgeries vary depending on the type of back condition that each patient has, but frequently a lumbar fusion is done. In this procedure, a “cage” formed by metal screws and rods are inserted to the bone above and below the problem disc to “fuse” the joints at that level and keep them from moving. 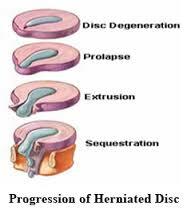 Also, the part of the disc that is protruding out is cut out (discectomy). These procedures are irreversible and only done in severe cases as a last resort treatment. For people that have a severely pinched nerve, the effects of this surgery are profound. I’ve heard several patients say that right after they woke up from surgery, the feeling and strength in their affected leg was instantly better. Unfortunately, I’ve also met people that had this surgery and then have their pain come back. This is likely due to an untreated movement pattern that remains present after the surgery is performed. Lumbar extension rotation syndrome (ERS) is the most common movement pattern affecting the discs. This movement pattern creates a muscle imbalance that causes the spine to put inappropriate pressures on the discs. Normally, movement between each bone in the spine should be about the same during everyday motions. For example, when you bend backwards, your spine should gradually curve with motion occurring equally at each joint. 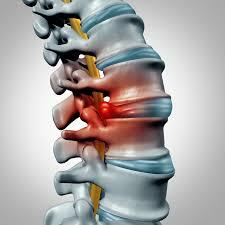 But having chronic lumbar ERS causes the back to bend sharply at one or two joints. Movement of the spine in other directions also becomes altered. This causes the muscles, joints, nerves and discs in the area to become irritated. If it goes on untreated for years, it will likely create a disc herniation. 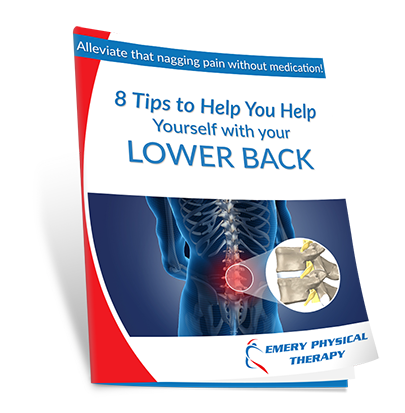 Early ERS symptoms may feel like a low level soreness or tight muscles around the low back. You may even have recurring back spasms every few months. I find that patients usually blame it on age and think that it is a normal part of life to have these back symptoms. This is false thinking! Feeling tension in your low back is not a normal thing, it should feel mobile and pain free. At Emery Physical Therapy, we specialize in finding the exact low back joints that are stuck and then getting them to move normally again. We identify the weakest muscle group and teach you exactly how to strengthen it in order to start fixing the problem for good. I HAVE BACK PAIN SITTING AT MY DESK. WHAT CAN I DO? Emery Physical Therapy near Des Plaines, IL has Certified Orthopedic Specialists to help you recover in the event of an back injury. To learn more about our services, contact 847-786-2014 or click HERE.